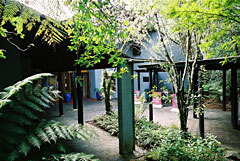 Waitangi National Trust Visitor Centre, 1982. 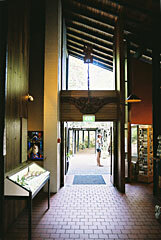 Waitangi is thought of in New Zealand as the birthplace of the nation so it is appropriate that a Maori architect designed the visitor centre for the Waitangi National Trust and the entrance to the trust's 500 hectare estate which includes the Hobson Memorial, Treaty House and Te Whare Runanga. 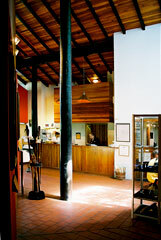 The Visitor Centre is the last of Scott's big public projects. Scott designing the centre in 1981/82 and it was opened in April 1983. 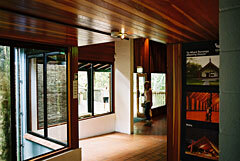 The visitor centre is now surrounded by bush and the external design is largely hidden by the trees. The front entrance connects to the car park via a long covered walkway that makes imaginative use of overlapping sheets of Hardy Board following the curved path. 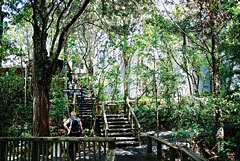 Like the Waikaremoana Visitor Centre, the rear of the building connects out into the bush with elevated walkways and steps. 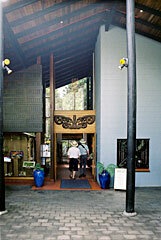 The centre continues themes Scott was exploring at the time, using cut away and extended rooves similar to the Apatu house at Ngamatea, along with other familiar Scott elements and materials; concrete block, brick floor tiles, native timber matched lining, poles and pillars. There are references to the marae and the wharenui, but also to the church and the wool shed. 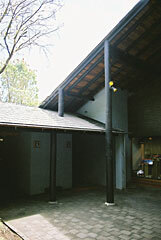 Scott has used large round poles to support the roof and the ridge angles and veranda at the front are reminiscent of the meetinghouse. 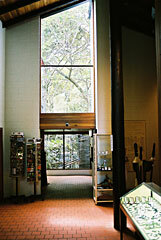 Inside there is generous use of native timber on walls and ceilings and the large internal reception space is high and generous with large windows looking out into the bush. The spaces are well proportioned with interest created by contrasting colours and materials. This is architecture worth visiting. This building makes good use aluminium window joinery. Scott was a master of the wooden window and he has integrated the aluminium sensitively, giving the windows a lightweight feel while maintaining attractive internal and external details. The toilets are worth a paragraph. 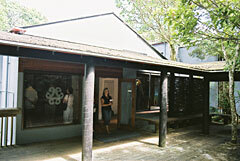 To the left of the entrance they remind me of marae toilets - all function with little privacy or comfort. The men's toilets have a clear glass window from floor to ceiling looking in on the urinal (it has been screened off from external view with a brush trellis). 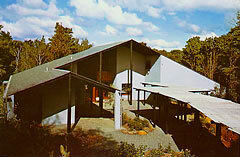 John liked toilets with a view; the Martin house has a toilet with a glass external door. Like the concrete bunker toilets at the Waikaremoana Visitor Centre these toilets are a highlight.